Collecting Highlights Archives Past issues of the Collecting Highlights column for Anne McCaffrey Fans. Posts are open for reply, so feel free to add a comment about what you own or would like to! 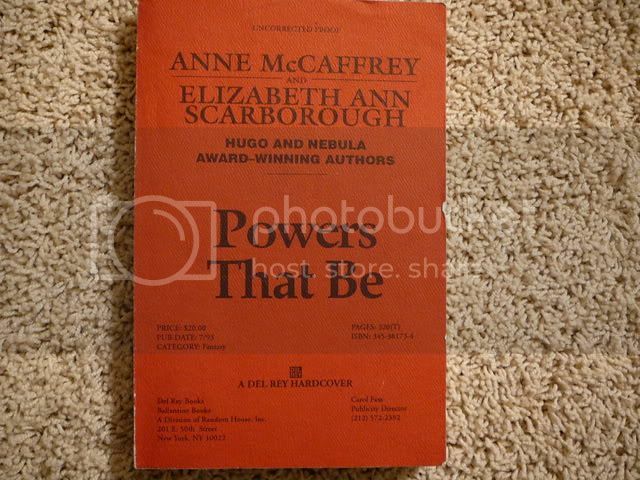 This is an uncorrected proof copy of POWERS THAT BE co-written by Anne McCaffrey and Elizabeth Ann Scarborough. Anne and Elizabeth have co-written several books together and Elizabeth did the presentation at Anne's Science Fiction Hall of Fame induction ceremony. POWERS THAT BE was published in July 1993, ISBN is 0-345-38173-4 and published by Del Rey. The cover of the uncorrected proof states the category of the book as Fantasy.....wonder how Anne feels about that! We all know she writes Science Fiction! This is the first book in a series that has become popular with fans of both authors. One of the neat things about this copy is that it was Elizabeth Ann Scarborough's own proof copy and she's signed it. I emailed her and confirmed that it is her own proof copy and have a copy of that email inserted inside the proof too. 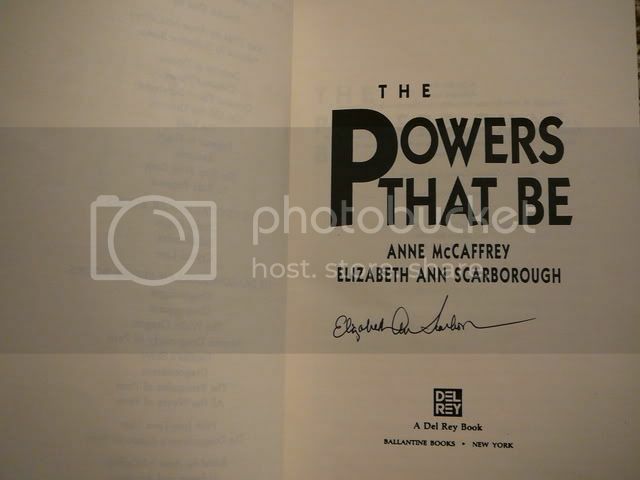 I paid $10 for this copy several years ago and for comparison I found a proof copy of POWER LINES signed by Elizabeth on bookfinder.com for $30.00. You may be wondering how I know this is Elizabeth's own personal uncorected proof copy, other than the email to confirm it. She lives in Washington state and I used to get to go to the area where she lives and haunt a book store there. They had all sorts of goodies by Elizabeth and of couse Anne too. The book store owner said that whenever Elizabeth needed a few quick bucks she'd bring down some signed items for him to sell. I happened to be the lucky one to pick up this proof copy. I decided to flip thru it to see what it was like as I'd not bought many proofs before. I was very surprised to find that this wasn't an UNcorrected proof! There were penciled corrections throughout the book! I told myself that it would be neat to compare this proof copy with the final product, but I never have. Maybe someday I'll get that proverbial 'round tuit' and actually do it. If I do you all will be the first to know! Proof copies of books are now bound so nicely and contain the complete text that they could almost be considered the first first edition. I have read somewhere where there are those who are doing just that. So proofs are another item to consider collecting. Proofs used to be fairly inexpensive but because of the way they are now bound and complete the prices are rising. The pricing also depends on the book, an older book like the CARRADYNE TOUCH is going for $100 but I found a SASSINAK for only $14. These are both unsigned proofs. Signed proofs start higher. So here's another possible collecible for you to consider.....PROOFS!! I have a proof copy of Get Off the Unicorn. Pencil marks thru out. And the title is corrected to read Get OF the Unicorn. I always wondered why they bothered to send such to the author to correct, if they were not going to correct it. I got an uncorrected proof copy of Juliet Marillier's "Wolfskin" for 50p. I bought it mainly cos it's a Tor printing. Very interesting *Hightlight*...having one of the authers on copies would make one of these extra special indeed. The part where ELizabeth sells some of her signed copies when she needs extra cash...just goes to prove that wonderul writers just don't make the kind of money that they should. Especially when you think about the momentary fame of the sports star...against the long lived fame and endless delight that you get from a great writer. Just doesn't seem quite right!!! Amen, Maelin!!! You just don't think of authors as needing money since they usually write several books. But Anne, I think is a rarity, meaning a successful writer. Again, meaning she has been able to support herself very well with her writing. Sara --- An ARC and a Proof copy are basically the same thing. Proofs would be the term to use for older ones and ARC (Advanced Reading Copy) for the new versions. 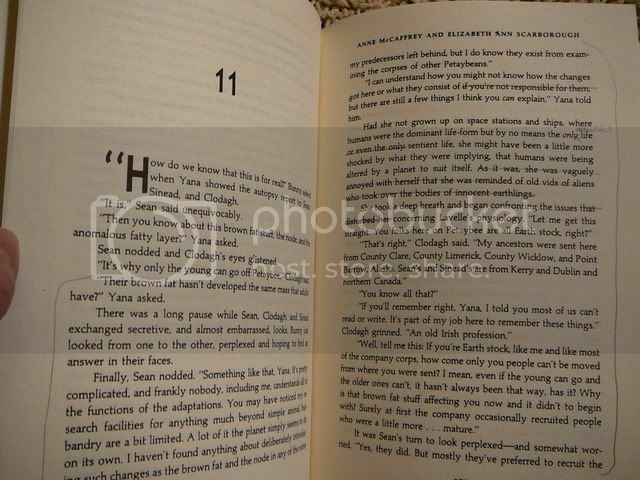 An older proof copy may not have the entire text (someone tell me if I'm wrong please!) but an ARC will have the entire text. And to toss something else into the mix.......there are F&G proofs also. These are Folded and Gathered proofs. Books are printed on large sheets that hold 4 double sided pages with perforations dividing the sheet. (The pages are torn at the perforations to create the book.) A few of these are pulled (at least were in the past) or rather 'gathered' together in page order and then folded on the perforations instead of tearing at the perforations. These are not bound in any way, just left folded. I have a F&G proof and another early proof copy of The Coelura in addition to a TOR bound proof copy. To see these samples check out Collecting Highlight #38 "The Coelura Universe". Before proofs or ARC's are made there are bound and unbound galleys. A (unbound) galley is the first "proof" that is sent to the author and you may look at it as the revised, corrected and printed manuscript. Sounds a little like the old folios of the 17th century. -nodnod- I know what they look like in that case. ^^ (I'm doing extra research on books and the book industry back from the year dot with help from one of my History lecturers). I can remember my mother going ovber her F&G proofs. There was a complete code of marks for the various mistakes. Hans - thanks for that extra bit of info! I'd love to have one of those to add too! And I'm sure there are a few other collectors who'd love one too! P'ter - I didn't know there were codes for mistakes! More info! Thank you for adding that! Sara - you've got your hands in a lot of different pies! Woodcrafting and books, what a busy girl you are! The codes/signs for correcting (also called: proofing) manuscripts are learned when you study in the field of publication or, like I did Public Relations and communication. They are international (like a universal language). Oh, lucky you Hans!!! And thanks for the neat link!!! !